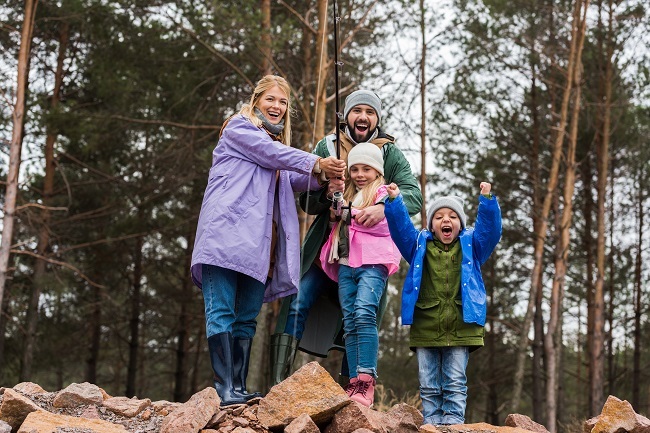 You’ve been waiting and waiting and now the day is finally here – the day you get to take your children on their first fishing trip. It’s bound to be a day for the memory books, so you want it to be perfect. The best place to start is planning what you’ll need to take with you. Patience. Teaching kids how to fish is going to require a good amount of patience. Plan on lots of snagged lines, fishing poles flung into the water, and kids splashing each other with water. Just remember, the first trip is going to be covering the basics and hoping for the best. Tackle box. You probably already have a tackle box if you’re an avid fisherman. If so, take a picture of it before you leave because it will never look the same once a bunch of little fingers goes through it! Kids love to dig through the lures and bobbers, so it’s best to temporarily remove any sharp hooks and other items to a separate place to avoid accidents. Fishing poles. Fishing poles come in all kinds – even princess and superheroes. Kids will love having their favorite characters on their fishing poles. Most little poles will even come with a special bobber and mini tackle box. Rig the poles and use the practice lure before embarking on the trip. You really can’t practice casting enough. Bait. In the event, the bobber even makes it into the water – and it may take a while – you’re going to need bait. For most kids, this is either the best or worst part; grabbing the worm and shoving it off the hook. Be prepared to go through a lot of bait. Camera. You definitely need to bring a camera to capture every moment. A camera that is waterproof works the best, but any will work. You may not end the day with big fish but you will definitely end with big smiles. Remember, the first trip is a practice run. Have fun and regale your children with all your fishing stories – and it’s even okay to embellish a bit. So gather up your poles, lures, bait, and of course – some good luck! Need some assistance in making your fishing trips extra special? Contact us today!